The Fair Oaks Village Enhancement Committee (FOVEC) was initiated in January 2007 and formalized in October 2007, as a working group of property owners, business owners, staff from various Sacramento County Departments, and other stakeholders. FOVEC was created to evaluate improvements that would enable Fair Oaks Village to increase its viability as a thriving business district. FOVEC - related work is being coordinated with the Sacramento County Supervisor's Office, Fair Oaks Chamber of Commerce and the Sacramento County Department of Transportation. The history of Fair Oaks began long before its 1895 development as an agricultural colony. Native Americans, the Maidu, lived here for at least 10,000 years we are told. Approximately fifty years before the colony’s beginning, our area was inhabited by the miners of Northern California’s Gold Rush. And thereafter a few families settled in the areas we now call Citrus Heights, Orangevale, Carmichael, and Fair Oaks. Families from the East Coast and Midwest soon read in the various newspapers, magazines, and advertising brochures touting Fair Oaks as a demi-paradise just waiting for both the serious and gentleman farmer to enter Eden and effortlessly make a good living or to retire without worry. The soil was fertile, the climate moderate, water was plentiful, an electric railroad was planned, and success awaited anyone who would step up and take a chance. When prospective colonists came to see the area, excursion trains brought them from Chicago to Sacramento, then on to Folsom and through the already-producing orange groves in Orangevale terminating their journey in the Fair Oaks bluffs. Years later the Fair Oaks Development Company, along with a few increasingly influential Fair Oaks residents, was able to convince Sacramento County to build a bridge across the American River. The company negotiated with the Southern Pacific Railroad to build a rail line from the existing Sacramento-Placerville line to the new Fair Oaks Bridge. The development company then improved the water system by bringing in 28-inch steel water mains with many laterals. With these improvements, Fair Oaks had a fair chance at life. Sadly, the Fair Oaks Development Company was not able to generate sales; by 1902, the company gave up its efforts. Just about this time however, Fair Oaks began to bloom as a community. A real school had been built. A business block with first-rate architecture was completed. A lumber yard and other stores were opened. An agricultural cooperative was established. Several first-rate homes were built. A bank was started. Dredging for gold in the American River had begun on a major scale, and a rock crushing plant thrived from the gold dredge tailings. 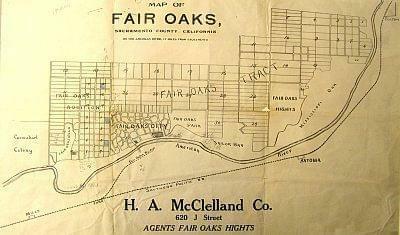 Fair Oaks seemed to be holding its own, even thriving well past the turn of the century. In 1932 however, nature dealt the agricultural community a hard blow and there was a devastating freeze. Not only were many orchardists and merchants struggling in the early stages of the Great Depression, but the freeze wiped out dreams of commercial or farming success. While a few struggled on, many had to find other ways to support themselves. With improvements in transportation, many could commute to other places for work. The development of air bases in nearby Rancho Cordova and North Highlands, along with the later boom in aerospace attracted residents of a new breed, many of whom made their living by working for concerns outside the community. These events changed Fair Oaks life forever. But if one takes a slow walk around town today, one can see the vestiges of orange groves, and the olive and almond orchards. Some original Fair Oaks buildings hide under several layers of remodeling. A lucky visitor might meet residents who were born in the 1920s and 1930s who can tell them first hand about what life was like when Fair Oaks was fulfilling its original design intent. This brief historical narrative is excerpted with permission from the Fair Oaks Historical Society’s website and was written by Steve Abbott in 2005.